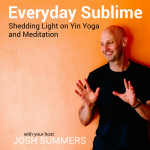 Back from the Yin phase of Winter Hibernation, I’m excited to tell you about what’s in store for Season 2 of Everyday Sublime. 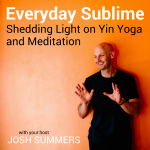 I have a couple of quick updates about the Summers School of Yin Yoga, and a line-up of superstar interviews for 2018. We’re off to a great start this year, and I’m looking forward to connecting again. In 2018, the Summers School of Yin Yoga will be unrolling a unique way study Yin Yoga with a modular curriculum, as well as a way to earn a 200hr or 300hr certification in Yin Yoga, if you’re interested. Each of the core modules of the school will include an online component (taken prior to attending the session) and a live four-day immersion. This will allow us to start at a much higher level when we come together live, and will provide a much richer learning experience overall. I find Aaron’s trios are the settings where his personality and voice shine brightest. In my interview Aaron, he talked about the depth of connection that forms between jazz musicians when they’ve played together for years and years and years, and it’s that level of connection and interpersonal knowing that facilitates the kind of expression and improvisation that is so charged and captivating. It’s that depth of familiarity which facilitates the sublime.